Every day, an estimated 160,000 children miss school due to fear of attack or intimidation by other students– an alarming, disheartening statistic. The good news is that the vast majority of students already have a bullying prevention tool in their pocket. We just need to give them a way to use it. That’s why Blackboard is proud to announce today that we are offering TipTxt, a two-way anti-bullying service for students to confidentially notify school officials of bullying or school safety issues, to every K-12 school in the U.S. for free. All schools need is a dedicated phone line, and Blackboard will absorb all other costs. We’ve never done something on this scale, and no company has made such an offer. To add even greater visibility to this effort, we are thrilled to be partnering with the National PTA. Why are we doing this? Since our inception, Blackboard has worked to solve problems in education. And bullying and school safety are large problems. We hope that making this powerful service available at no charge to every school in the country will be a small step in creating safer learning environments. To make bullying prevention as effective as possible, we must remove as many barriers to reporting it as possible. Studies confirm that young people increasingly prefer to use text or SMS to communicate. According to a Pew Internet and American Life Study, 75 percent of children between the ages of 12 and 17 carry a cell phone, and people as young as eight text on them. Nearly as immediate as a hotline conversation, texting has the added advantage of seeming more anonymous. This makes some students more likely to use it to report uncomfortable – or dangerous – situations. 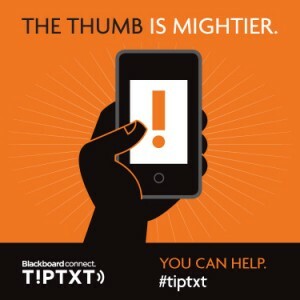 With TipTxt, when a student is involved in or witnesses a bullying incident, they simply text a descriptive message to the unique district TipTxt number, and the message will be confidentially relayed to school administrators who can then respond with immediate action. Preventing bullying is a delicate, and tiered, process. It requires involved parents, conscientious school administrators and, maybe most importantly, empowered students. Technology is an invaluable tool in the mission to end bullying. It reminds students they are not alone – and gives them access to instant, expert help. Bring TipTxt into your community by contacting us at Blackboard.com/tiptxtK12,and get involved in the conversation to help stop bullying with hashtag #tiptxt. School bullies, take notice: the power has shifted. also press a panic button if they need help at anytime and anywhere. It’s a good mobile device from SafeKidZone.